Wall hangings, art, and photos serve as the stylistic icing on the cake that is your home. Wall art draws the eye, pulls together space, and makes your home inviting. The search and installation of pieces you love are worth the trouble because it genuinely improves your home. While there is no set of rules in place for adorning a home, following these basic instructions will help you select the perfect pieces. Go by size, style, color, theme, inspiration, or floor plan. The options are limitless. The top piece of advice every person needs to choose the perfect wall art is this: select what you like. If you see something and it does not foster feelings of enjoyment or relaxation, don’t put it on your wall. 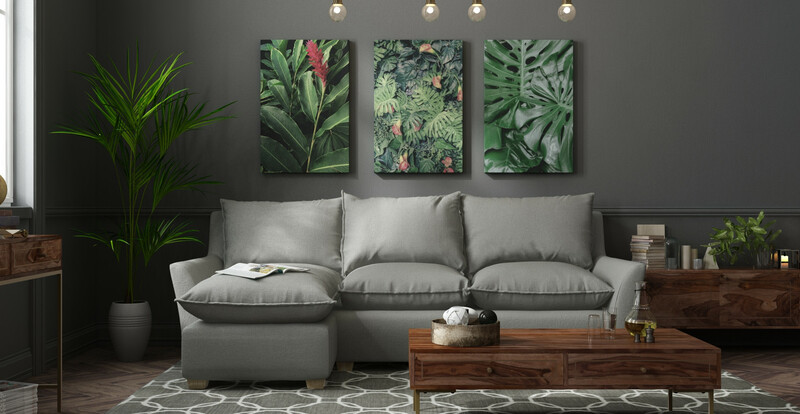 It is your home, your design, and your money being spent on wall art.While it is common for family members to make compromises in selections, this definitely does not mean you need home décor that does not suit your style. You live in your home, so enjoy the pieces you have adorning your walls! 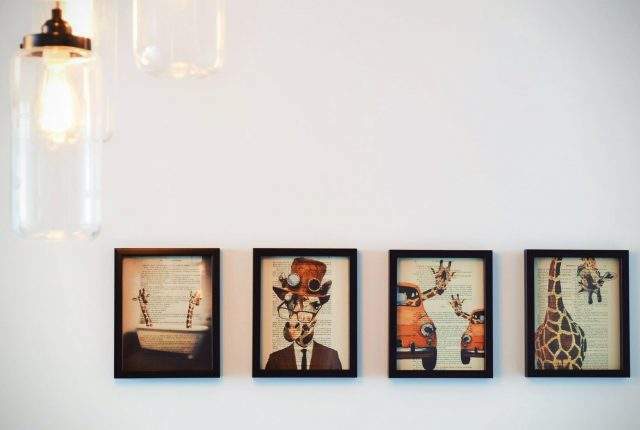 When it comes to wall art, it gets tough if you are not particular about sizing. Go into your search for wall art with a size in mind for quick selection. Looking to decorate a room? Many people find it easier to start with the larger pieces and work their way down. As you begin pulling together your space, purchases add up, and soon enough your home will be decorated to your preferences. Oversized: These parts are 100 centimeters in length or greater. Before buying a piece this large, measure your space to see if it can accommodate it. Oversized wall art acts as a focal point of a wall or a room. Large: This size frame is from about 80 to 100 centimetres in length. Large wall art could serve as a centerpiece or be balanced on either side with mini or small pieces. One to two large pieces per room is standard. Medium: Wall art in this category is from 60 to 70 centimetres long. Some pieces can stand alone, but medium pieces also go well when grouped with one another. Keep your space symmetrical when adding medium wall hangings. Small: A small hanging goes well above shelving, pieces of furniture, and on short walls because it is 45 to 59 centimetres in length. Small art pieces go well in pairs or groups of three to six hangings. Mini: The smallest size of frames are mini, falling in the range of 25 to 44 centimetres. Think about anything the size of a piece of paper or smaller as a mini piece of art. You often see them sold as collections; it is common to see at least three to four of these sold together. When selecting wall art, go with a general idea about the size you are looking for in a room. Most bathrooms cannot accommodate oversized wall art, just as most living rooms aren’t decorated with minis. Pictures should not be more than two-thirds longer than your sofa. Photos should be at least 15 centimetres above the edge of your furniture. A small piece of art can’t fill a big space. Group small pieces together. Works by the same artist complement each other well. Consider the height of ceilings when choosing the size. Be sure it fills the space in length and width. Of all of the ways to choose wall art, decorating your home based on style might be the most natural. More than anything, selecting wall art by style is personal. A few examples of styles to use include: a focus on antique pieces, a bright, bold form, or a Bohemian look. A secret trick is to select a fashion designer you like and mimic your home based on the style of that designer’s clothing. Is your home a Levi house or a Ralph Lauren? Choose pieces that match the style of your room, including the furniture you already have or articles you have accumulated along the way. Invest in at least one significant or oversized piece you’d love to see for years to come. Purchase a set, a trio, and even a group of mini or small pieces. These go great above windows or on short walls. Use frames to emphasize your style whether it is through matching or mismatched ones. Mix materials by adding wooden art or a metal sign to space. Add a sign with words but no more than two or three that you can switch out. Did you know in the world of decorating, there is a big difference between room colour palettes versus the color palettes of art? With art, there is more allowance for the use of bold color schemes or the brights you may only reserve for an accent wall. There are two major approaches to selecting your wall art by color. Your most significant piece of artwork should have a background color that matches your wall color. Reference the colour wheel when selecting complementary shades. Use the same colour but in different shades. 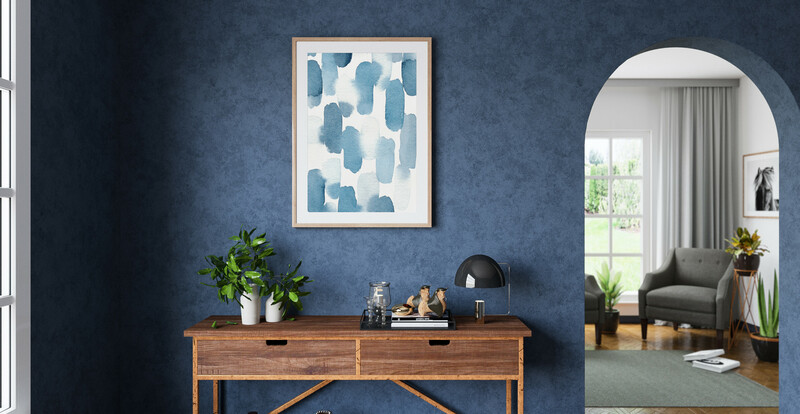 A light blue and white painting looks beautiful with a navy-blue wall. Only choose wall art if that exact shade is already in your room. Most spaces should not exceed four colours to look pulled together. Stick to black and whites when in doubt about color. Black and white match everything while also adding to the elegance of a structure. Stay away from bright colours and neons as these do not always match up with neutral wall colors. Keep the colors in your wall art equal in proportion to their presence in the room. For instance, if your place is black and white with red throw pillows, select wall art that is black and white with a touch of red. Make use of mirrors to reflect art. Reflections make the room look larger and duplicate the appearance of all wall art. Alternatively, choose art for your room that introduces bolder shades on the same colour scheme. Your wall color does not restrict your palette but instead serves as a baseline for your evolving sense of personal style. Bright or neon pieces stand out against walls with neutral backgrounds. Tie together the room with line work or style rather than colour. Pieces from the same artist could be different colors but pulled together with the style of painting. Play with texture and color in wall art, furniture, and accessories. Buy pieces made from mixed materials like wood and metal. Adding the colours of the artwork to the accessories of your room emphasises the boldness of your wall hangings. Purchase based on undertones. The undertones of a painting are the underlying qualities of the picture. Dark brown undertones look great on light brown walls, even if light brown is not actually in the artwork. Make use of photo frames to emphasise your favourite pieces. Frames do not necessarily need to be in standard colors like black, white, silver, or gold. Introduce a new colour into the room in twos or threes. One occurrence of a bright pink could be accidental, but two circumstances make it intentional. Repeating colour increases its impact in the room. Did you build your home around a certain theme or idea? Even if you did not start with this intention, many purchasers select items based on a theme, even if subconsciously. For example, a home with a beachy feel has light or bright walls, artwork of sea life, pieces made of driftwood, and more. Homes with a theme are simple to decorate because you can quickly eliminate items that do not fit your theme. Whenever you are in a store selling home goods, merely scan the space for pieces specific to the theme. Also, pick up pieces when on vacation, with family or friends, or even in unexpected places like garage sales. Homeowners that are patient in decorating with a concept, like the beach, in mind can save money by directing their attention down one path. Much like designing around a theme, an inspiration piece drives all of your other purchasing decisions. An inspiration piece for a room could be a piece of art, a sofa you love, or even just a trinket with a meaning you like. One woman’s antique paperweight is another woman’s grand piano – both potentially inspire the design of an entire room or even a whole house. Use your inspiration piece to determine the colour scheme of your room. It is best to narrow it down to three or four colours. Focusing on a set scheme makes it easy to match an inspiration quote. Select wall art that follows the colour scheme of the room. With a set colour scheme, you can combine patterns, geometrics, solids, and more. As a general rule, introducing a new colour requires you to add it in at least two places for a cohesive room. Trust your natural instincts; it does not need to be perfectly matching to be a beautiful room. Surround yourself with things you love. Don’t forget a touch of white. The room cannot be covered in colour, or the eye does not get a break from all of your design. With more and more homeowners purchasing or designing open floor places, picking wall art is tougher than ever. The most important rule to follow in selecting wall art for an open floor plan is to purchase and hang with the purpose of clearly defining space.Create a cohesive look between rooms but place your wall art firmly in one space. For example, a wall shared between a kitchen and living room should have wall art specifically in the kitchen and then in the living room. When you’re selecting wall art for an open floor plan, you need to consider space and how you use it. For example, if your dining room opens into your living room you may not want traditional food-focused artwork in that room. 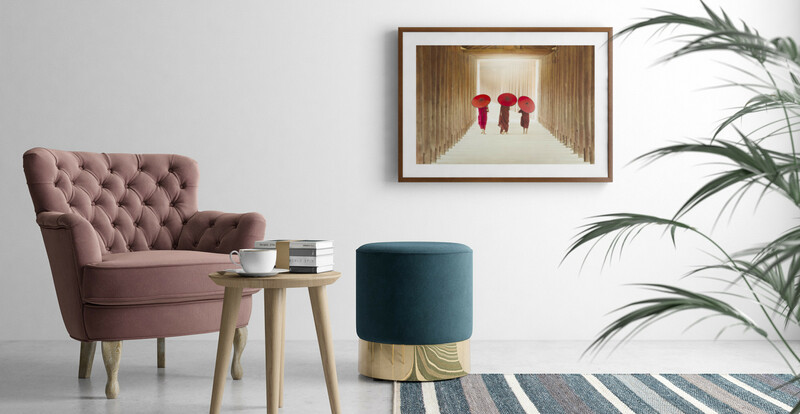 The right wall art sets the tone for your space by keeping it inviting, communicating what type of family you are, and defining different rooms.Whether you are focused on colour, size, a theme, or even an inspiration piece, choosing your wall art does not have to be difficult. You deserve a home that is comfortable but also suits your sense of style. Have fun selecting your wall art. 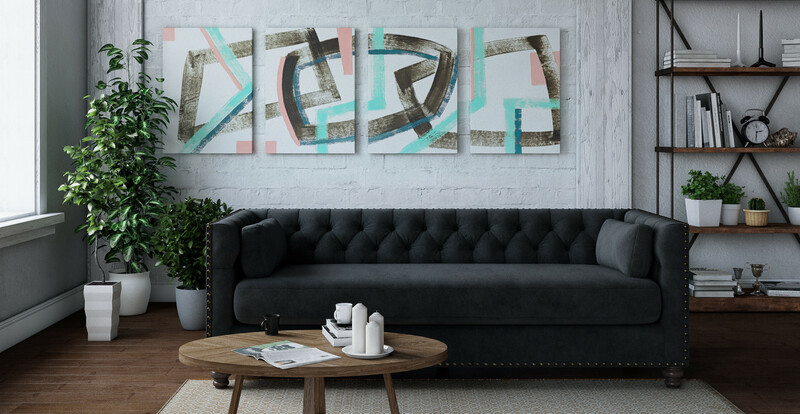 A cohesive home full of aesthetically pleasing artwork is in your future.